If you’ve ever eaten blueberries or cranberries it might not come as a surprise that the Tasmanian answer to those superfoods are none other than the epacrids. 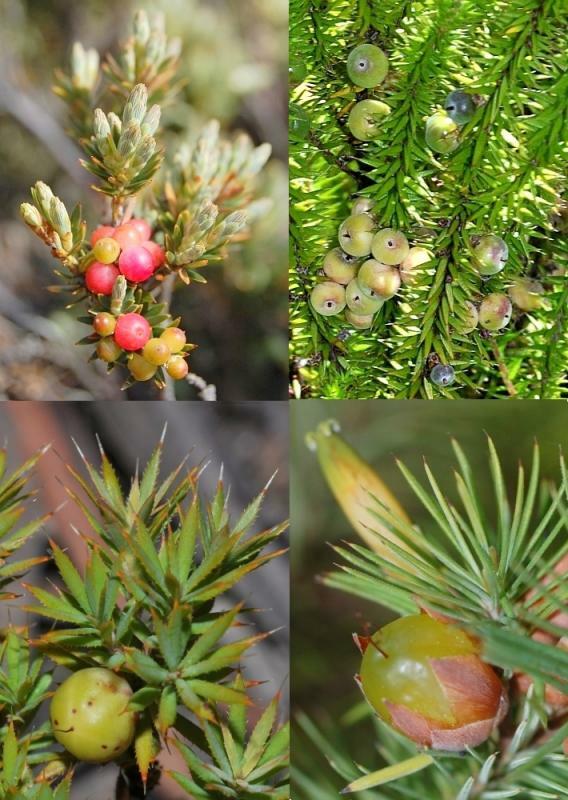 Many Tasmanian species produce edible, and some of which are highly palatable. Over the past few years and particularly this spring and summer I have been making it a point to try out all the heath plants I could find. Here’s a list of what I know are edible epacrids which I have sampled and my thoughts on their palatality (a score of 1 being the least palatable and 5 being absolutely irresistable). Bon appétit. The red berries are somewhat persistent. It’s not fabulous but worth a try. Score: 2.5/5. This one has a unique smell to it and has the most distinctive taste of the lot. Pick the whitest berries. Score: 4/5. Definitely a good eat when ripe. Make sure the berries are yellow-yellowish before picking. Score: 4/5. As with the Native Cranberry, this is a good eat when ripe. Pick berries that are as yellow as possible, to the point of appearing a little translucent. Score: 4/5. Very attractive to behold. Very satisfying to pick. Very gratifying to bite into. But alas, it is a little astringent, leaving a slightly dry taste on the tongue. I wouldn’t say it tastes particular cheesy either. I wouldn’t eat much of it unless I were desperate. I have yet to try Cyathodes dealbata (Carpet Cheeseberry) and C. platystoma (Tall Cheeseberry). Score: 1.5/5. 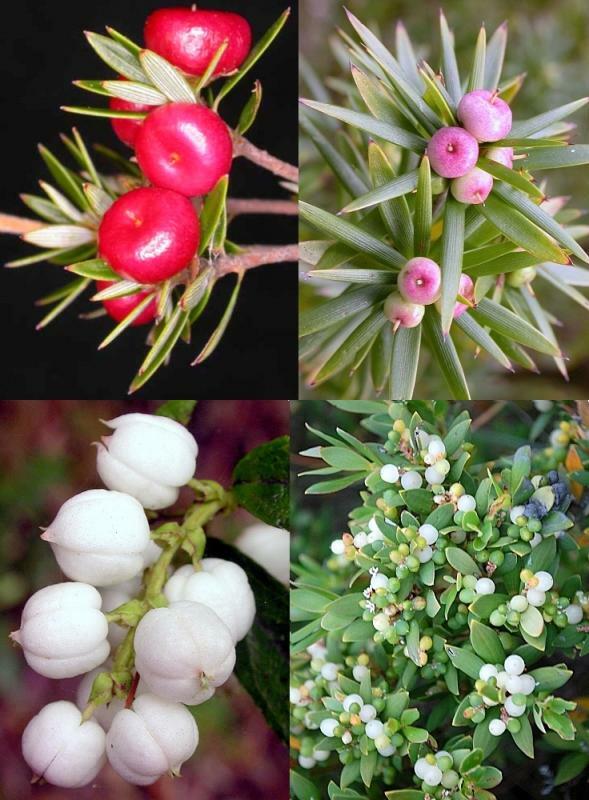 An attractive shrub of Tasmania’s subalpine to alpine regions. I cannot recommend it more. Pick ’em and eat ’em when white. Score: 4/5. The berries of these species, particularly L. juniperina are so prolific at the correct season, you’d wonder why the birds don’t get to it before you do. Once you take a bite you might gather some understanding of why this might be the case. What I said of Cyathodes applies here. I have not tried L. pendulosa (Drooping Pinkberry). Score: 1.5/5. It’s one of the wonders of the Tasmanian coast! Hunt for them at any vegetated Tasmanian beach. The berries ripen white and dislodge easily in great numbers when ruffled by the hand. They were meant to be eaten! The berries make a sweet, slightly salty (little wonder why), slightly sharp tasting snack. 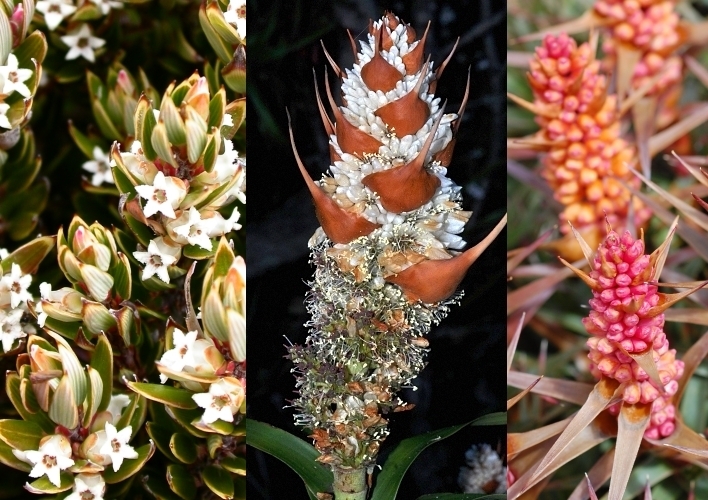 I have not managed to try L. australis (Spike Beardheath) or L. lanceolata (Lance Beardheath) and I will update this post when I do. The other common Leucopogons have dry fruits and are not worth trying. Score: 4.5/5. Aptly named the Peachberry Heath, the fruits of this species have a ‘downy’ appearance like a peach. It is hard to find mature fruit. I’ve tried but I may have gotten immature ones with very thin pulp. Score: not rated as yet. Not always easy to get the berries but surely worth a try. Score: 3.5/5. I do not have a fruit photo to show at the moment but will put it u when I get one. Trust me thought when I say that they are good to look at. The gastronomical verdict however is as with Cyathodes. I am not surprised since the genus Planocarpa was once part of Cyathodes. From their fruit shalt ye know them! Have yet to try the other two indigenous species of Planocarpa. Score: 1.5/5. Not so much for eating. These species produce dry fruit. However, when flowering, the petals, which fuse into a cap-like structure, can be plucked off and the petal bases can be sucked at. See my video. In my opinion, Richea dracophylla produces a more flavorful nectar. Richea gunni (Bog Candleheath) might also be worth a try. Score: 4/5. A gift from the coastal heath! This rather prostrate heath plant makes for a good snack. The berries are almost totally covered in brownish papery bracts but try to pick yellow berries. Score: 4/5. The fragrant purpleberry is a rainforest plant. Tried it a few times but have never been too impressed. It is very mildly sweet but has the same effect on the tongue as the Pinkberry (Leptecophylla spp.) once but can’t remember the taste. I’d eat it if I am lost in a rainforest and forgot to bring a sandwich. The thymeleaf purpleberry is a shrub of alpine areas. Tried it before too but have since forgotten the taste. Have not tried T. disticha (Spreading Purpleberry)) or T. cunninghamii (Straggling Purpleberry). Watch this space. Score: not rated as yet. 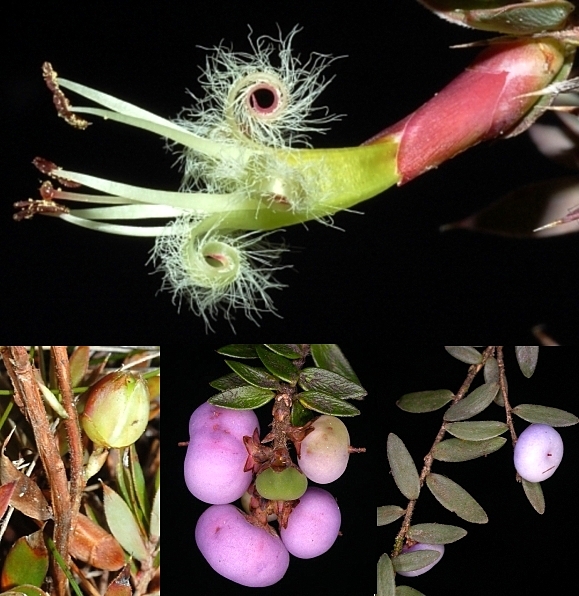 This entry was posted in Bush Tucker, Shrubs and tagged Acrothamnus montanus, Acrotriche serrulata, ant's delight, Astroloma humifusum, Astroloma pinifolium, Carpet Frillyheath, Cheeseberry, Cyathodes glauca, Cyathodes straminea, edible plants, Epacridaceae, Ericaceae, Fragrant Purpleberry, heath, heaths, Leptecophylla abietina, Leptecophylla divaricata, Leptecophylla juniperina, Leucopogon montanus, Leucopogon parviflorus, Lissanthe strigosa, Native Cranberry, Peachberry Heath, Pentachondra pumila, Pineapple Candleheath, Planocarpa petiolaris, Richea dracophylla, Richea scoparia, Snow Beardheath, Spreading Cheeseberry, Styphelia adscendens, Thymeleaf Purpleberry. Bookmark the permalink. 3 Responses to Have’ya had ya heaths? Thanks for the compliment Matt! Great blog. 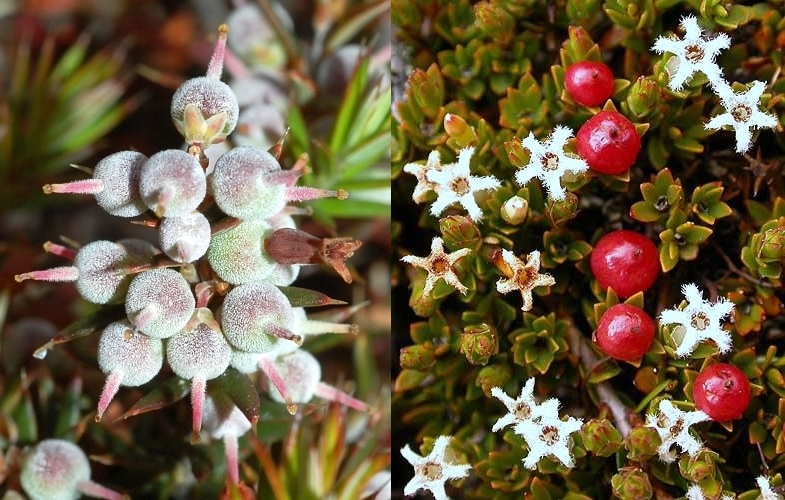 I’ve tried quite a few Tasmanian native berries and found the nicest to be a prostrate alpine plant with red berries – tasted like an apple. Not sure what it was and unfortunately didn’t take a photo at the time, however the leaves vaguely resembled a gaultheria. Any idea what it might be? Also, how tall/wide does a cider gum need to be to ‘tap’ it to extract the cider safely (ie without causing significant damage to the plant)?